Yes, I know that in my last review I promised to get away from the stars, but I spent the last weekend playing some old arcade titles and thus decided to write a small review that just happen to be of a classic shoot ’em up. Sorry. Anyway, today’s subject is Xenon (the DOS version, obviously). Xenon is a shoot ’em up developed by The Bitmap Brothers and published by Melbourne House. It was originally released in 1988 for the Commodore Amiga, Amstrad CPC, Arcade, Atari ST, DOS, MSX and ZX Spectrum. It was re-released the following year for the Commodore 64 and in 2013, the Amiga version was ported to the Blackberry. 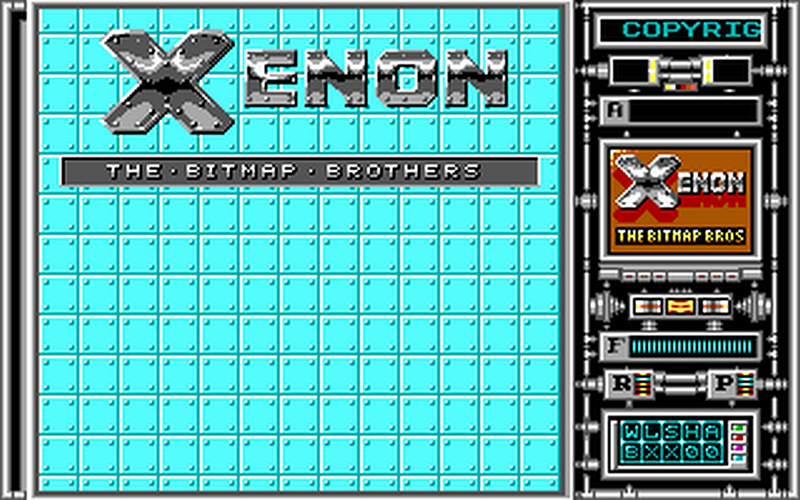 Xenon is also one of the first games developed by The Bitmap Brothers along with Speedball, which I’ve already reviewed. As you can see, the intro is nothing to write home about and the only way to learn the backstory is by reading the manual. Actually, the manual goes a long way in describing the game’s background, but the basic gist of it is that you play as Darren (or Darrian, depending on which version of the game you’re playing), a young Federation space pilot, who’s responding a stress call sent by his superior officer, Captain Xod. To save him, Darren has to go through 4 sectors of space occupied by the Xenites, the game’s baddies. And this is all you need to know, although the manual expands upon it. The game starts with a futuristic-looking tank morphing into a spaceship and travelling from the end of the level to the beginning of it (then what’s the point of crossing said level, I wonder, but I digress) and morphing back to the tank. Then an animation of a man appears on the small right screen saying “Sector 1”. This man is none other than one of the founders of The Bitmap Brothers, Eric Matthews. Grab the “P” powerup to increase your weapons’ power. The main screen is quite big with a small status panel on the right. In this status panel is where you can find all the information needed about your ship. At the top, above the small screen, there’s the score and below it, the number of lives on the left and the number of the sector or level on the right and below it, the altitude bar. Then, below the small screen, there’s the fuel bar, which is basically your ship’s health. Below it, the rate and power bars, which are related to the ship’s weapons and below, all the bonus and weapons you can get in each level. Now your ship is not just a normal spaceship because it can transform into a tank. The spaceship plays like in every other vertical shoot ’em up: you can move your ship in any direction, while it shoots up and the screen scrolls from bottom to up. But when it transforms into a tank, it also changes its movement: now you can turn and shoot in any direction and the screen stops scrolling. This feature is what makes Xenon stand out among all the other shoot ’em ups of the time. And grab this powerup to get 2 wingtips that’ll increase your firepower. However you can only use the tank in the 1st and 3rd levels and while it’s slower than the ship, the fact that you can shoot in 8 different directions makes it more versatile in combat. But there are some enemies and turrets in higher places that can only be destroyed by the ship, so it’s recommended that you switch between both when needed to destroy all the enemies (and get more points and powerups). Also, when an enemy formation or a turret is destroyed, they leave behind a powerup, which can be a new weapon, attack or an upgrade for your ship, your tank or both. I recommend to grab these in order to upgrade your attacks, even if there isn’t a lot of variety in the powerups available. But you’ll revert back to your default weapon if you lose a life and/or start a new level, which increases the difficulty. 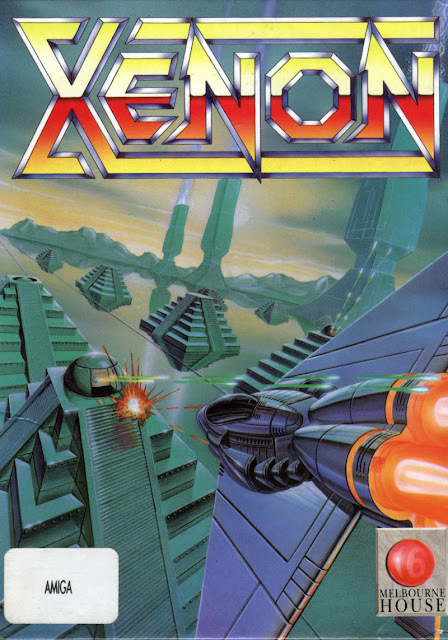 And speaking about the difficulty, Xenon might just be one of the hardest shoot ’em ups I’ve ever played on the PC. It’s one of those games that to counter the fact of having only 4 levels, the developers ramped up the difficulty in order to increase the gameplay length. Quite common in arcade-style games like this one. Also the level design isn’t bad, although there actually only 2 different designs (the 1st and 3rd levels are very similar, as are the 2nd and 4th levels). The only big difference between the levels are the bosses, which are basically bullet-sponges until they reveal their weak spot. And you face each boss twice, once at the middle of a level and later on at the end. Now let’s move to the technical aspects. The 16-colour EGA graphics are quite good for the time, with a nice palette and average animation. The sound effects are okay, although using digitised speech samples in the PC speaker is impressive. Too bad that there’s no music whatsoever, which is surely missed in a game like this. The controls are also average, both the keyboard and the gamepad/joystick. In fact, controlling the ship is somewhat easier than controlling the tank due to it being faster. In conclusion, Xenon is not a great shoot ’em up compared with other games of the same genre, but since there weren’t many shoot ’em ups on home computers at the time, it became an instant success. However, it was quickly surpassed by other classic shoot ’em ups, including its vast superior sequel. I can’t really recommend this game, but if you’re a fan of the genre, you own to yourself to give it a shot. The Amiga version is vastly superior with better graphics, sound (and music! ), animation and controls. The original Atari ST version also looks great, although the sound doesn’t compare with the Amiga version. But since I haven’t tried the Atari ST version, I can’t really compare it with the other versions. So, what do you think of the review? And what’s your favourite shoot ’em up? Let me know below in the comments or on our social media. And next time, I promise to finally move away from the stars and into something more grounded, but not to reality. Until then, keep on flying through the stars and playing. See ya!